I attended the 34th National Sports Collectors Convention last week– it was a five-day show that started last Wednesday, and lasted until Sunday. Talk about a marathon! I promise to have a recap of the show soon. 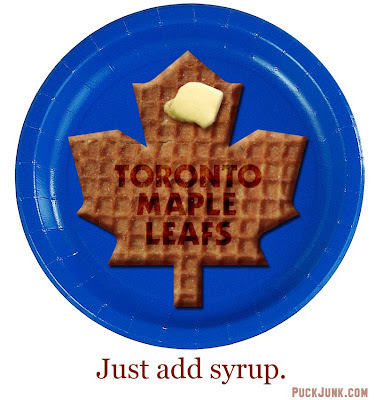 I’ve just been swamped with other writing engagements: The Hockey News, Beckett Hockey and Chicago Side Sports. However, I did recently update both The Hockey Noob and Sal’s Hockey Autographs. The only way to get this set was to attend the National as a VIP. However, you can win a set of these cards here. 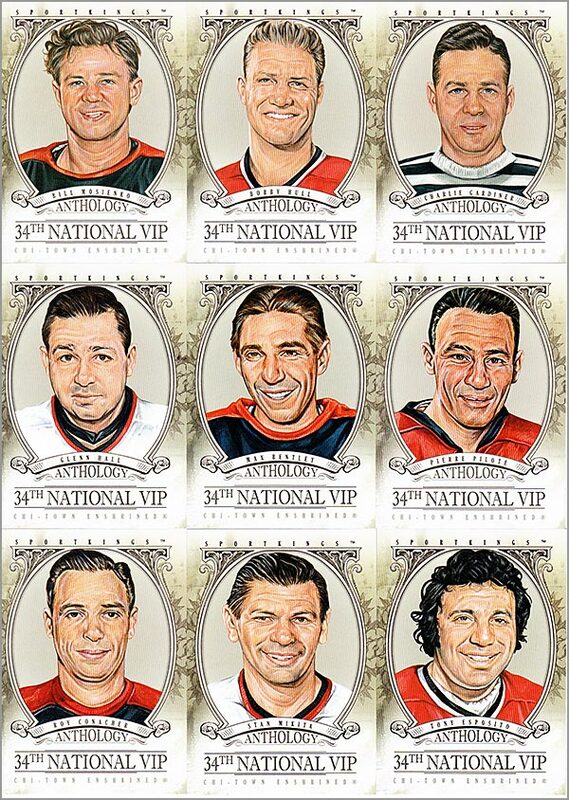 CONTEST: Win a set of Blackhawks VIP cards from In The Game. HOW TO ENTER: Post a comment below, telling me who your favorite Chicago Blackhawks player is — either past or present — and why. I’m not looking for long answers, maybe around 100 words or so. I’ll pick the five answers that I like the best And no, it has nothing to do with who your favorite ‘Hawk is. Don’t say your favorite ‘Hawk is Chris Chelios to win favor with me unless your favorite ‘Hawk really is Chris Chelios. I’m just looking for interesting answers. DEADLINE: Wednesday, August 14 (one week from this writing). Remember, there will be five winners for this contest, so give it a shot. Special thanks to In The Game for providing the prizes for this contest. 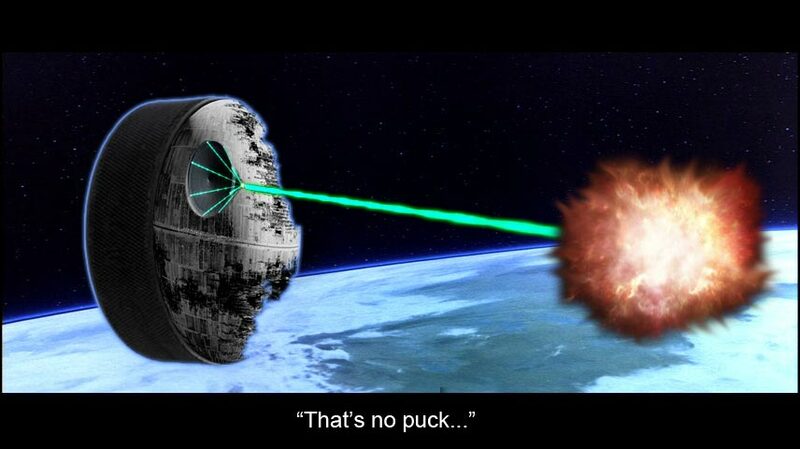 Thanks to everyone who participated in the Puck Junk One-Card Challenge. 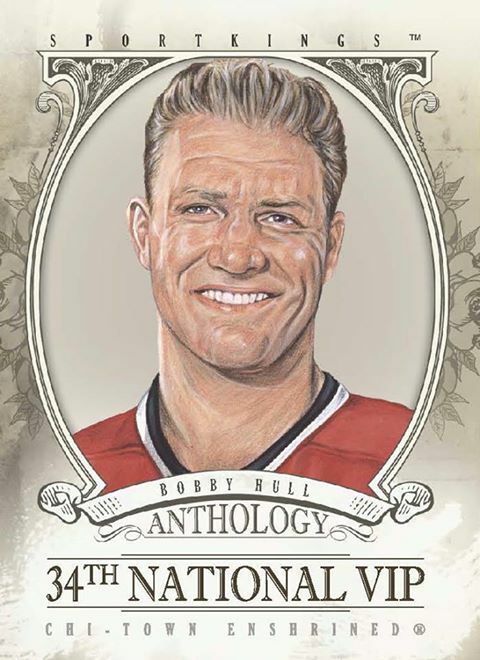 Twelve hockey card collectors helped one another (and me, too!) in completing sets that needed just one pesky card. The competition started out fierce, with a 5-way tie, but soon 3 broke from the pack and emerged victorious. First Place: Captain Canuck (5 goals, 3 assists) – Captain Canuck behaved like a true scoring champion in this contest, scoring 5 goals and 3 assists. He helped a few collectors complete sets. He was a very active player, posting many cards he was looking for. Plus, he mentioned this contest on not one, but BOTH of his blogs. The second mention–timed near the middle of the contest–helped give the One-Card Challenge a second wind and a few more players down the stretch. Captain Canuck selected the 1986-87 Edmonton Oilers Red Rooster Team Set as his prize–a fitting reward for a Gretzky-like effort. Second Place: Jimmy (3 goals, 1 assist) – Both Jimmy and Kazi scored 3 goals and 1 assist. But Jimmy had more “shots”–meaning, he listed more cards that he was looking for. That little bit of extra participation was the tie-breaking criteria that won him second place. Jimmy went with the 1991-92 McDonald’s All-Star set as the prize for his all-star effort. 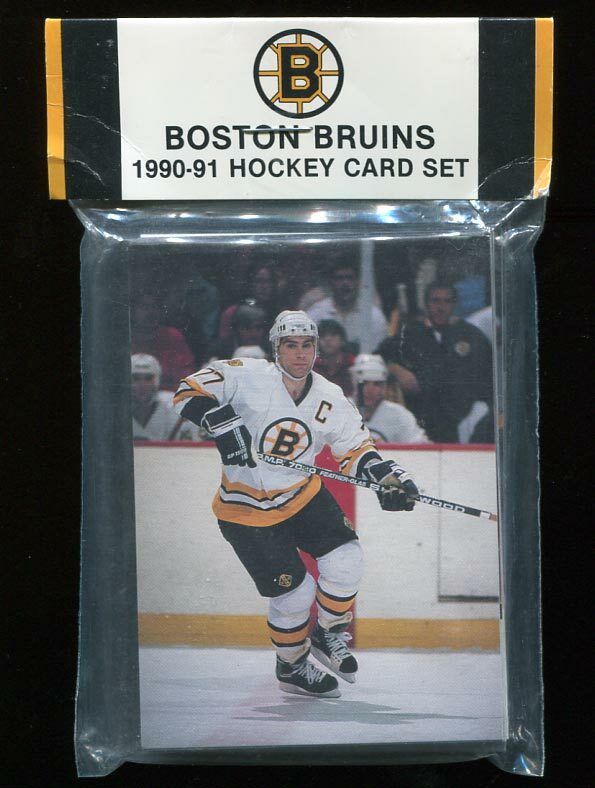 Third Place: Kazi (3 goals, 1 assist) – A grizzled veteran of hockey card collecting (he makes ME look like a rookie), Kazi selected the 1990-91 Pro Action Boston Bruins Team Set for his hard work. Thanks again to all who participated in the contest. Together, we helped each other complete TEN sets. I had fun, and hopefully you all did too. First, thanks to everyone who wished me well on Puck Junk’s 5th Anniversary. 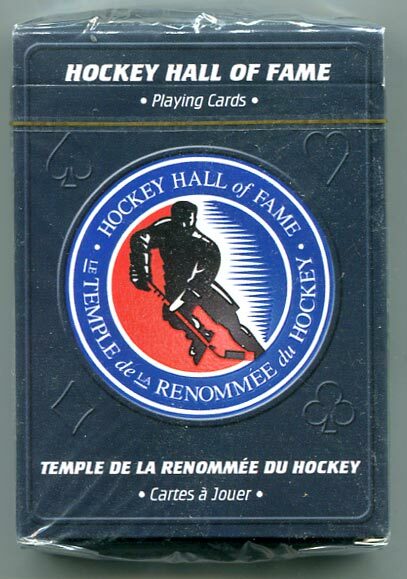 I entered you in the drawing for the deck of HHOF cards whether you asked to be entered or not (I just assumed everyone likes free stuff). Twenty-one people posted a comment, so I clicked the RANDOMIZE button 21 times. 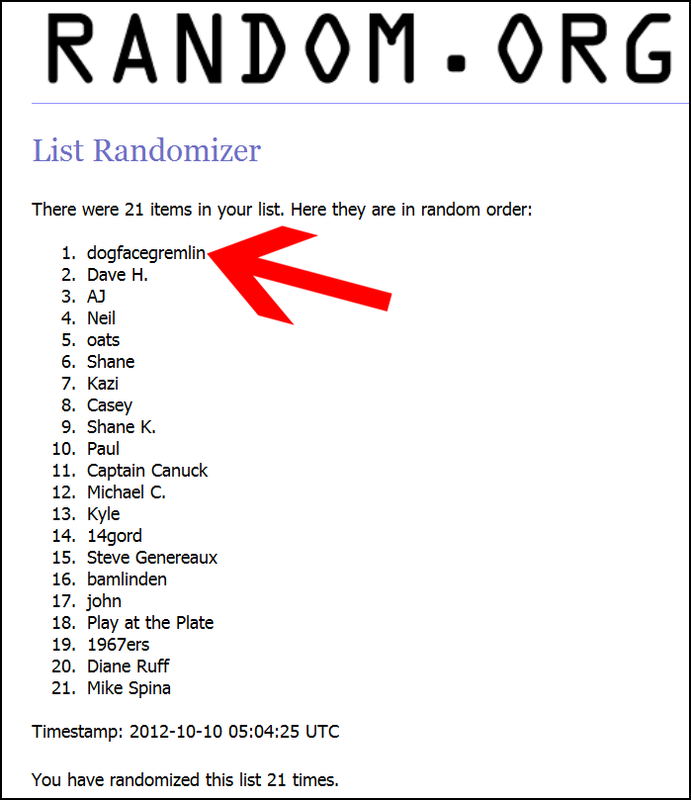 Congratulations to dogfacegremlin (a.k.a. Tim) for being at the #1 spot after the list was randomized 21 times. Prizes will go out at the end of the week. Thanks to Jimmy, Al (a.k.a. Kazi) and Tim B., three more of my sets are complete. 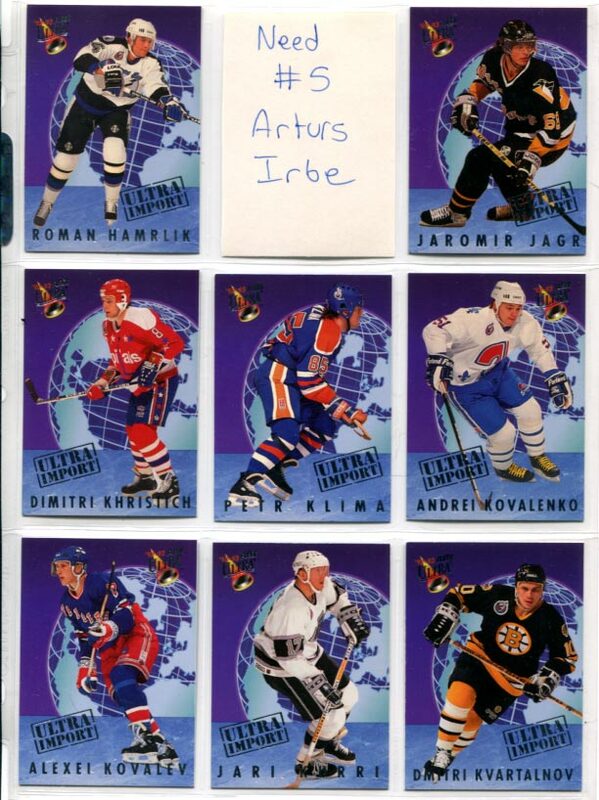 Jimmy sent me a 1992-93 Fleer Ultra “Ultra Imports” card of Arturs Irbe. I’ve needed this card for almost 20 years, so it is great to finally fill that last pocket in the page. I now have every base and insert card in the 1992-93 Fleer Ultra set. Kazi completed my 2010-11 Score Playoff Heroes insert set. Mike Richards was the last card I needed, and though I only needed this card for a bit over a year, it is still greatly appreciated. Tim B. gave me a 2008-09 Biography of a Season card of Mats Sundin. I tried putting this set together during that season, but Upper Deck did not send my local card shop all of the cards. Thus, I had to track down a good portion of these via trades. I’m glad I can put this one to rest, too. There is one week left in the One-Card Challenge–still plenty of time to hook each other up with that pesky “last card” to finish off our sets. Mail sent within the U.S. takes about 3 days to deliver; mail between the U.S. and Canada takes about 5 to 7 days. This means that you can still send and receive cards before the deadline, which is this upcoming Saturday night. 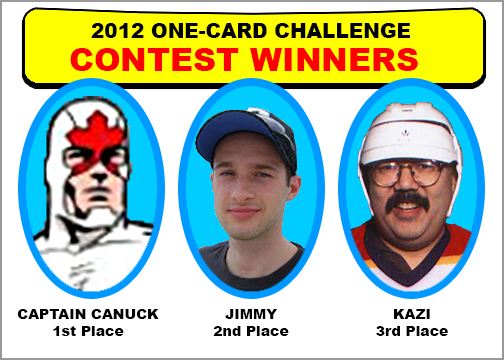 Captain Canuck is still in the lead with 6 points. Kazi and Jimmy are in a tie for second place with 4 points each. But it is still anyone’s game. Remember, a card sent to me gets you a goal and an assist. A card sent to another collector gets you a goal, and receiving a card gets you an assist. Check the contest thread to see if anyone has posted a card you have. Or post a card you need–maybe someone has it. Even if you don’t win, you can still help a collector get that feeling of satisfaction from finishing off a set. One of the most satisfying accomplishments for a collector is acquiring the last card they need to complete a set. Who doesn’t love filling that empty slot in a 9-pocket page, or crossing that “last one” off of the list? Likewise, one of the biggest frustrations is when you need only one card to finish a set, and yet that card somehow eludes you. Sure, you could buy the one card you need on eBay, but if it’s a common or cheap insert then you end up spending $4.00 to acquire a quarter card. 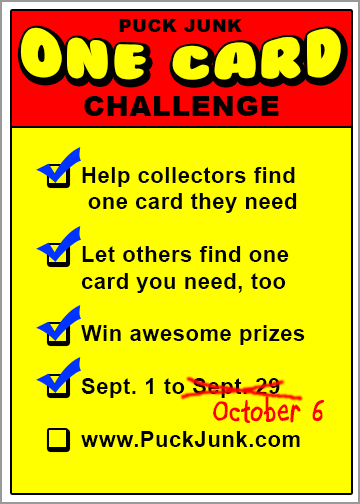 For the month of September, I am inviting hockey card collectors to help each other finish our sets that need *just* one card to finish. 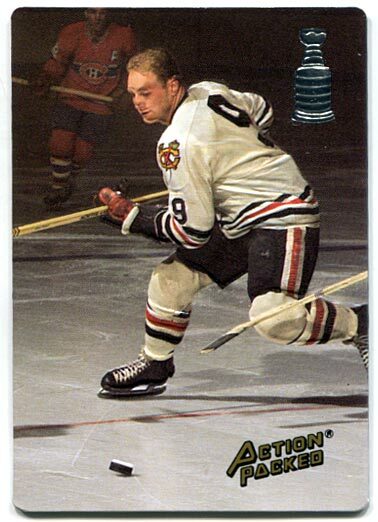 It can be a base set or an insert set, but it has to be a card that someone would be willing to *give* you–that is, don’t ask for a Wayne Gretzky rookie card or Steve Stamkos Young Guns card, because most likely no one is going to give you one for nothing in return. 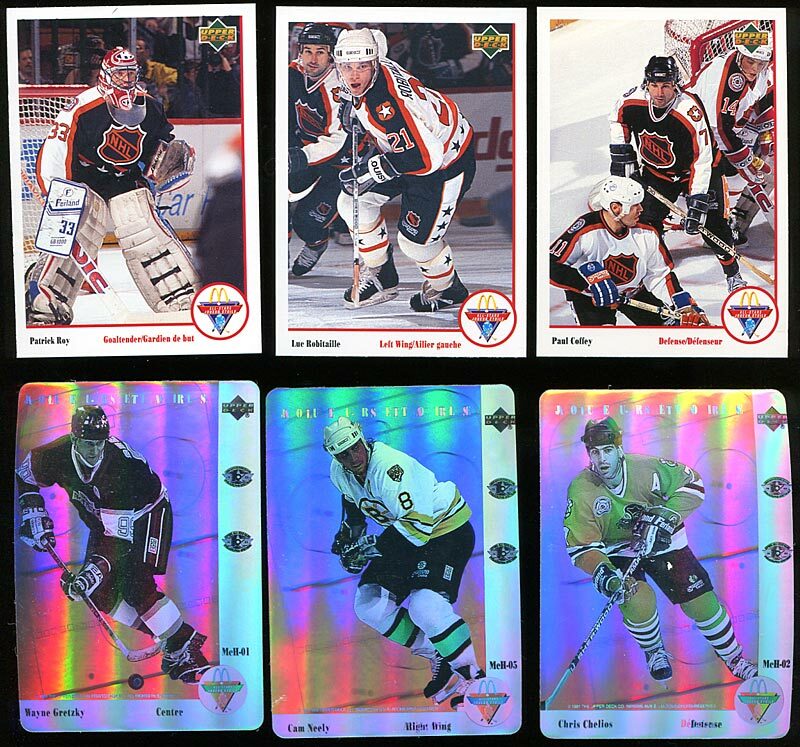 Because this is a hockey blog, I ask that we keep requests limited to just hockey cards. Please follow these steps carefully. Since there are prizes, I want to make sure everyone plays fair, and these steps should make this game pretty easy to play. For each set where you need just one card to finish it, post a reply below. Provide the year, manufacturer and card number (or player name). 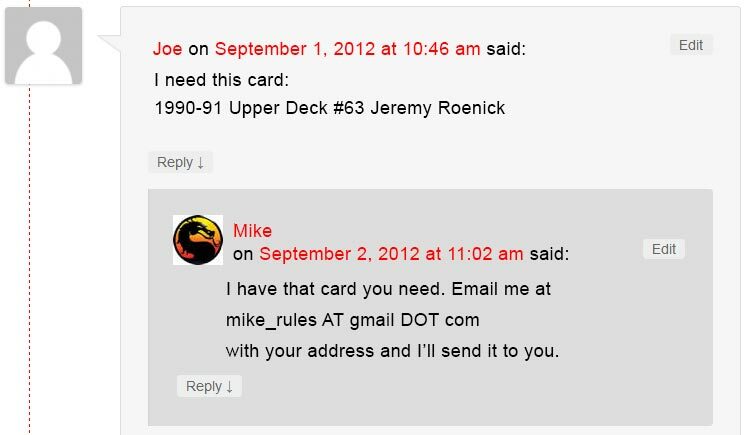 Don’t just say “UD Roenick RC,” say “1990-91 Upper Deck #63 Jeremy Roenick.” Make it easy for the other guy to help you. Make each card you need a separate reply. Make each card you need a separate reply. So, if you need 1 card from 3 different sets, make 3 separate replies. That will make it easier to track if a card is no longer needed, and easier for me to keep score. You can do this as many times as you need to, and are encouraged to keep posting replies throughout the month. If you have a card that you are willing to give (not sell, not trade, but GIVE) to the person to complete their set, write a reply to their post, stating that you have the card they need. Give your email address too so that they can contact you with their mailing address. Post a reply if you have the card someone needs. Make sure to list your email address so they can get in touch with you. Mail the card to the person who needs it. When you receive a card from someone, post a reply to their reply, letting me know you got it. You will each receive a point in the standings (see Scoring, next section). 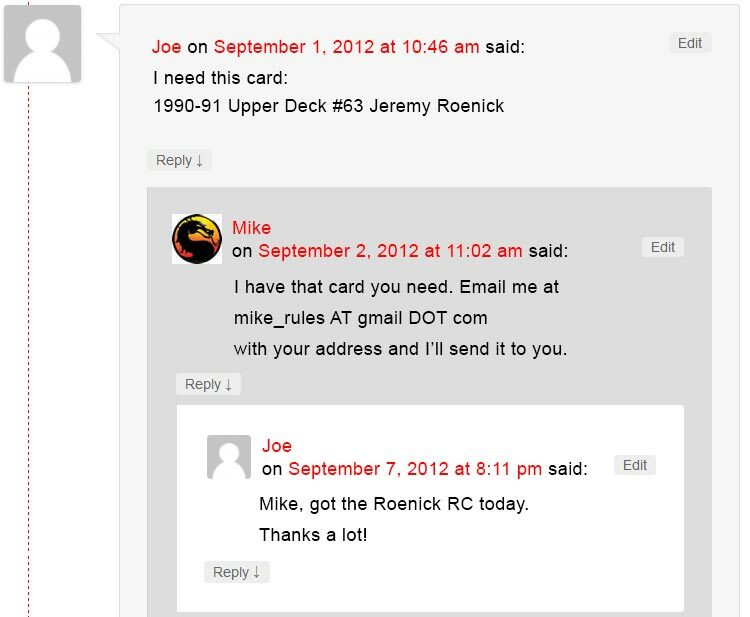 When you receive a card, post a reply to the reply. Helping out your fellow collectors is usually its own reward, but prizes never hurt. Thus, I will keep track of who helps who complete their sets with the following scoring method. If you GIVE a card to Sal (that’s me), then you get ONE GOAL AND ONE ASSIST. I will update the stats on who is leading the contest regularly. FYI, I am not giving myself any points. Send me a card and you get the goal and the assist. Receive a card from me and you get an assist. In case of a tie between two or more participants, the participant with the most GOALS wins first place. 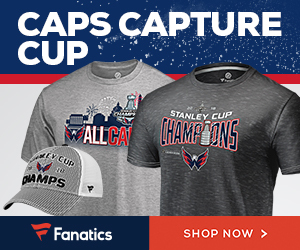 If there is still a tie–say two people have 10 goals and 10 assists each–then the person with the most SHOTS wins first place. In case two or more people have the exact same amount of goals, assists, and shots, then I will go on a Vision Quest until the true winner appears to me in a hallucination. Or I’ll just flip a coin or something. Oh yes, there will be prizes for First, Second and Third Place. I have not determined what they will be yet, but I will take into consideration the amount of postage the winner spent and make it worth their while.I will try to make each prize something cool, different or unique. I will post pictures of the prizes later in the month. You can see the prizes here. When sending one card, I recommend putting it in a top loader, folding a piece of paper around it (like you’d fold a letter) and mailing it in a business-sized envelope. This will weight less than an ounce / less than 30g and provide satisfactory protection against the perils of the U.S. and / or Canadian mail service. You may, at your own expense, decide to use a padded envelope. This is a good idea if you are sending someone several cards at a time. 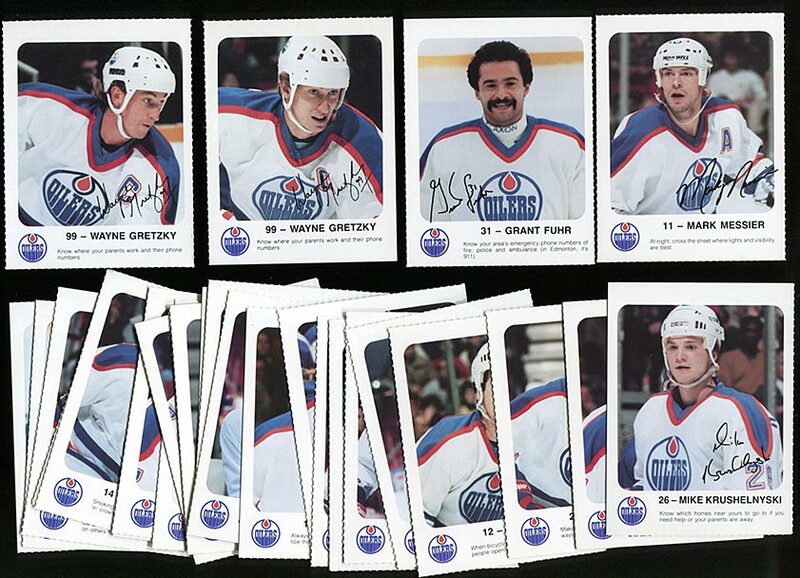 Do not expect someone to spend a lot on postage when giving you a free card–that is, do not expect a padded envelope and delivery confirmation if they are completing your 1990-91 Score Hockey set. The idea is to keep our postage costs low. I will close the contest on Saturday, September 29 October 6 (I am extending the contest one week longer than originally planned). That is the last day to post that you received a card from someone. If you have a blog and promote this contest, I will give you ONE GOAL in the standings. On your blog, mention this contest and link to this blog post. Then post a reply here stating that you promoted the contest on your blog. Provide the URL to the post on your blog, too. You can only do this once per blog. If you are like Captain Canuck and have two separate blogs, then you can do it twice. (But don’t just make a new blog up just for the contest). Promote this contest and get a goal for your effort. 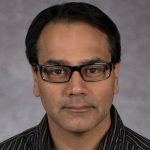 Are you a first-time poster? If you are posting for the first time on this blog, I will have to approve your comment. Once I have approved one comment from you, all of your future comments will appear automatically and not need to be approved. I may have left something important out, so if you have any questions about this contest, post it below so that I can answer for everyone to see. Let the One-Card Challenge Begin! 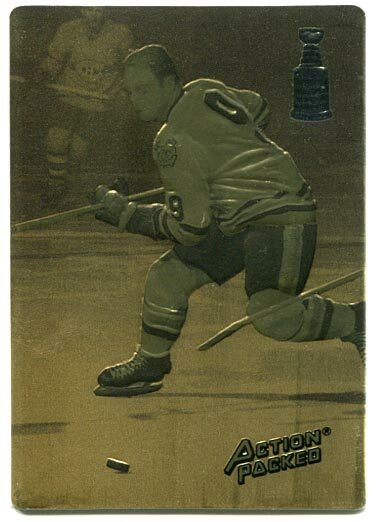 I want to thank everyone who entered last week’s “Stealth Contest”–that was, my unannounced, unadvertised contest tacked at the end of the Action Packed Hall of Fame Prototype Cards article. The prize one lucky winner could get was a pair of these prototypes. There were 11 people who entered, but only one could win. Welcome to the new Puck Junk website. I am still moving content over from the old platform. Some set reviews are missing, as are some images, and the Wrapper Gallery is down for the time being. Otherwise, this space station is fully operational. Why did I change things? 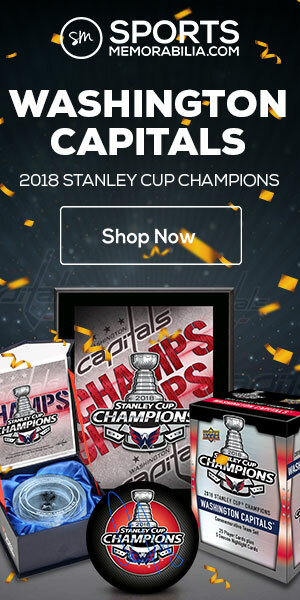 PuckJunk.com was a database-driven website I designed and coded myself–but the blog section was created by Blogger. In essence, they were two separate websites masquerading as one, which was really dumb in retrospect. Earlier this month, I decided to move all of the content (blog and non-blog) to a WordPress blog, and generally re-work everything to make it better. If you currently do not link to Puck Junk–but would like to be included in the contest–then link away! 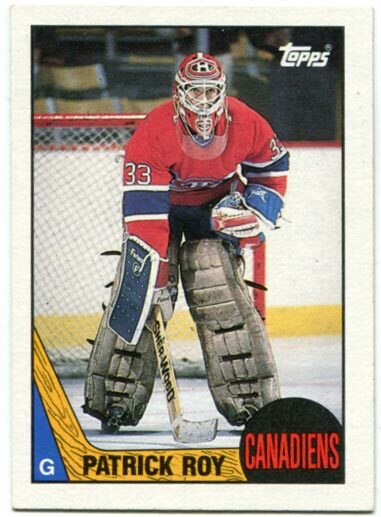 A near-mint card of Hall of Fame netminder Patrick Roy. This card is from the 1987-88 Topps set, is his 2nd card ever and has a Beckett high value of $30. But one lucky winner will get it–that lucky winner could be you!!! Everyone else who participates will get a random card from their favorite team. Sound good? Then please, update the URL in your blog roll. Author Sal BarryPosted on May 21, 2012 May 21, 2012 Categories Contests, News31 Comments on New Website…and a Contest!